When people said that The Rose Society and Adelina’s madness was darker than expected, they were not kidding. After the bitter blow of betrayal (but who betrayed who?) 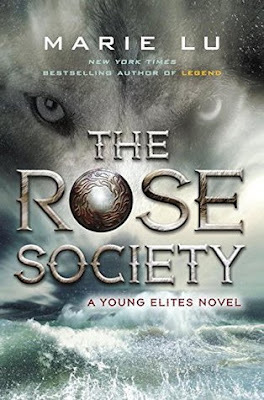 at the end of The Young Elites (book 1) Adelina, now known as the White Wolf, along with her sister set out to find other Elites who will help her get her revenge. Without saying too much, for fear of spoilers, let’s just say that this is seriously twisted and seriously epic. Since characters are dropping like flies, I am also insanely curious as to who will make it out of the final book alive, what relationships will remain in tact and which ones will bloom into something sweeter. Lu proves that no one is safe in this series, and I both admire and hate her for keeping readers on the edge of their seats like that. I tend to have a vengeful side, that is more prominent when I can unleash it within the safety of a book and made up situations. So for part of this, I could understand Adelina and what fueled her darker decisions and actions. But there came a point where even I was terrified of her. This is definitely a page-turner. It kept me on the edge of my seat and I could hardly put it down. The final book is going to be nuts, I can tell. Epic, unpredictable storyline and an excellent cast of characters. This trilogy definitely shows some of Lu’s versatility as a writer and I can’t wait to see what she comes up with next. If you do series books in your book clubs, I highly suggest these as there are some excellent discussion points.